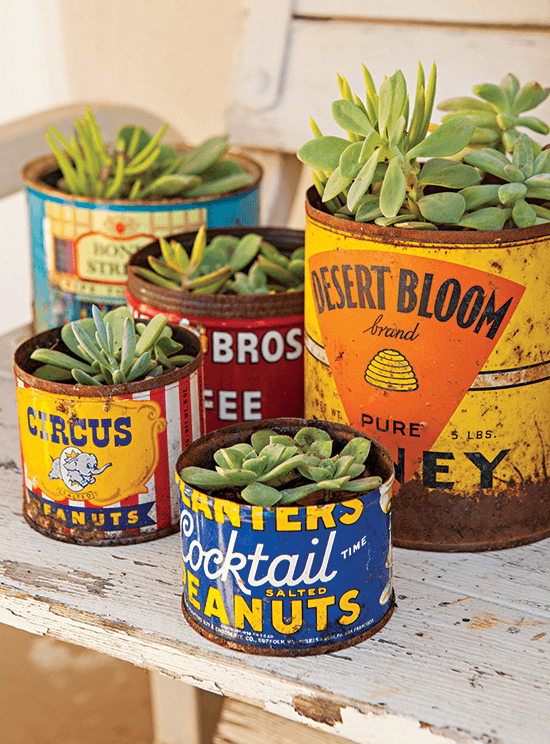 Breathe new life into old finds by reusing them in an exciting, creative way. 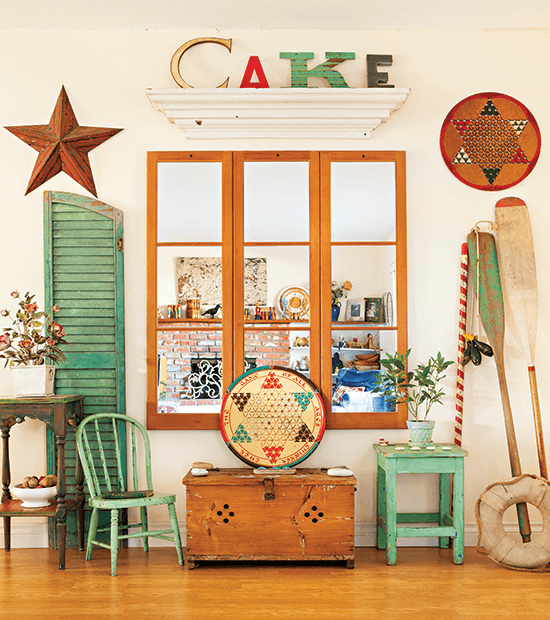 Kick up your vintage style a notch by getting inventive with ways to use, display and reinvent your flea-market finds into fabulous new décor pieces. 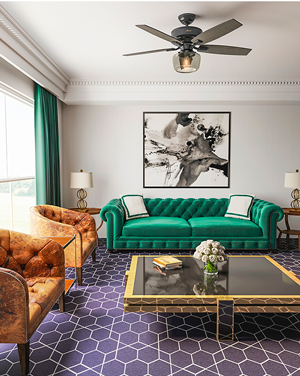 Not only will you wow your guests with your innovative ideas, but you’ll also have a personal piece with a new story to tell. Here are 6 ways to use upcycled décor in your home! Blur the lines between indoors and out by bringing common garden and architectural finds inside as wall art. 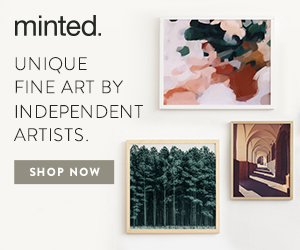 Floral and pastoral paintings add to the effect. Sometimes being creative doesn’t involve a lot of work, just a new way of looking at things. Here, interior designer Alison Kandler polished up a wrought-iron patio set, leaving the weathered patina intact, and brought it indoors as a dining room set. 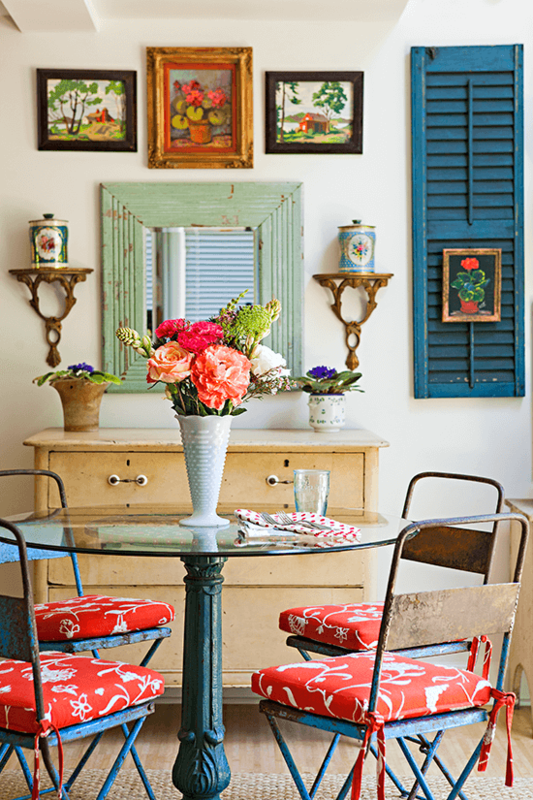 Designer Alison Kandler helped design her flea-market-loving mother’s tiny cottage. Part of packing a lot of style into a small space? Make sure each item speaks volumes of personal style. Here in the bedroom nook, Alison repurposed a fabulously chippy painted window shutter into a headboard. If you’ve amassed a lot of one single type of collectible, think of ways you can use it as a material. 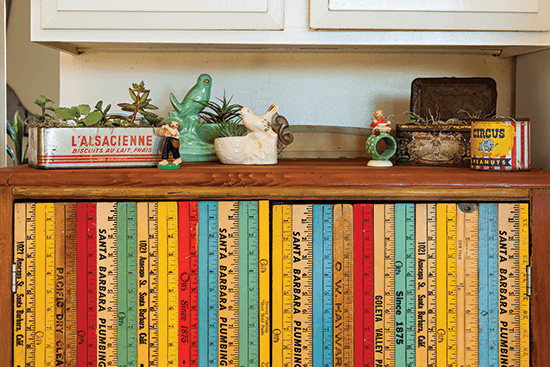 Colorful schoolhouse rulers get a new lease on life as cabinet fronts, transforming a basic cabinet into a memorable décor piece. Old game boards and vintage sports equipment make great wall art. Architectural salvage pieces such as shutters, mantels and moldings are flea-market gold. Upcycled as wall art in this living room, they have a big visual impact. It’s easy to drill holes in the bottom of cans for drainage when using them as pots for your succulents. Looking to amp up the vintage style in your garden? Here’s an easy project to get you started: Eschew plain pots for colorful vintage food tins to give your garden some vintage flair. Upcycled décor doesn’t have to involve much. 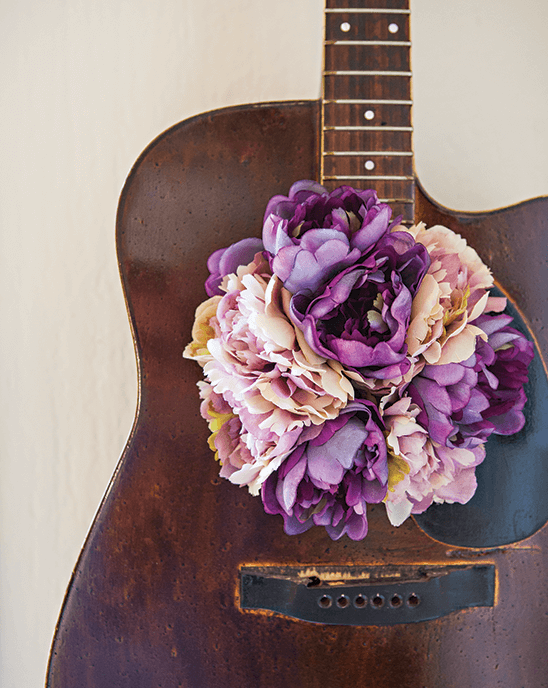 Designer Chantal LeBlanc hung an old guitar on her wall, doubling the creativity and stepping up the spring style by using it to hold flowers for a gathering. Looking for more vintage and upcycled décor ideas? 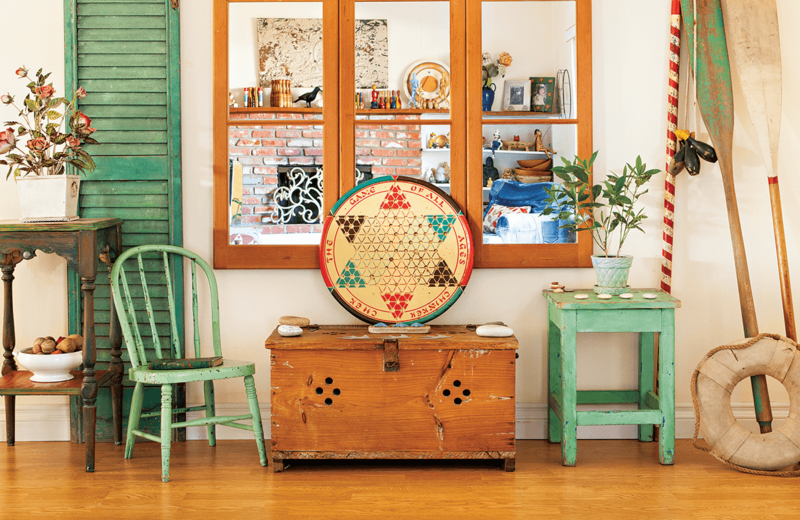 Tour this Ventura Beach home bursting with artful vintage creativity. 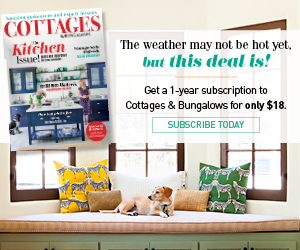 Of course, don’t forget to follow us on Instagram, Facebook and Pinterest to get your daily dose of cottage inspiration!